The good, the bad, and the ugly — you deserve to know every aspect of the siding you are choosing for your St. Louis home. No matter what form of siding you are looking to invest in, every material has its pros and cons. However, fiber cement siding is one that has a great deal of buzz and questions surrounding it. Hardie Board® siding is the number one siding in America, protecting millions of homes every year. And there is a reason for this. As a fiber cement siding, it has a great number of upsides, but it also has its cons. As a James Hardie® Elite Preferred Contractor, we know what this siding has to offer. So exactly what is it, and how does it help or hurt your home? Hardie Board remains the number one siding in America and continues to be the top of the line fiber cement siding. Fiber cement is a composite material comprised of cellulose wood fibers, sand, and water. As such, it is a durable material designed to mimic wood. Hardie Board is also engineered for climate, which makes it a versatile fiber cement for any region of the country. But as with any siding product, it has major benefits as well as its negatives. Here are the pros and cons of choosing Hardie Board siding for your home. Hardie siding protects millions of homes in the United States, and there is a reason for that. The list of pros surrounding this premium housing material is long. It gives homeowners benefits that many other forms of siding simply cannot. Perhaps the most well-known and sought-after benefit of Hardie Board is its durability. With its fiber cement makeup, it can withstand almost any element or weather condition from mother nature. Its resistance to the elements makes it fit seamlessly into almost any climate. Hardie siding is waterproof, fire resistant, and pest and insect resistant, which means that not only will the siding last, but it will protect the interior of your home for longer, without warping or breaking. Hardie Board siding is not only durable, but it’s also long-lasting. It has a longer lifespan than almost every other siding material option available. Fiber cement will never rot, and it doesn’t buckle or warp. James Hardie products also come with a 30- to 50-year warranty. With proper installation and care, your siding will have a warrantied replacement, or it may never need the replacement at all. Unlike wood siding, which needs to be repainted every couple of years, Hardie Board requires fewer paint jobs across its lifespan. The baked-on ColorPlus® technology that James Hardie® uses to coat its products keeps colors locked in and vibrant longer. It does not fade and is less likely to scratch. Hardie siding is a beautiful siding choice. It has grooves and grains that are designed to mimic the look of wood. This produces the attractiveness that real wood provides a home, but without the time-consuming care. It also provides a vast variety of design options, from vertical and horizontal paneling with smooth or rough texture to shingles and stucco. The number of options allows homeowners to achieve whatever look they desire for their property. In 2017, the Green Builder Media annual Readers’ Choice survey named James Hardie the “Greenest Siding Brand” for the sixth year in a row. This is because James Hardie uses sustainable practices and natural materials in the makeup of its products. Check out why we believe Hardie Board siding is the best environmentally-friendly siding option available. Strong winds and hail can cause damage to siding. However, the makeup and strength of fiber cement make Hardie Board siding more resistant to heavy impacts. It will not crack or dent and is one of the best ways to protect your home’s exterior from storm damage. The list of downsides to Hardie Board siding is far shorter than its positives. There’s not much to dislike about it. However, here are some items you should know before choosing Hardie® siding for your home. 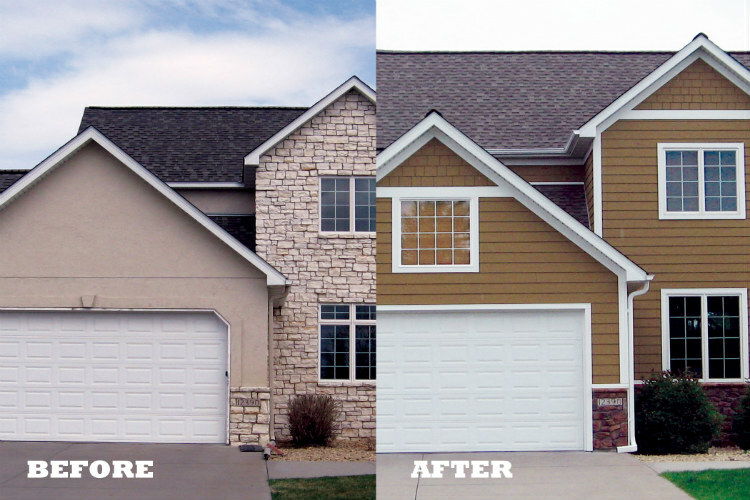 Due to the makeup of fiber cement siding, the Hardie Board siding installation process can take longer and prove more difficult than many other materials. Fiber cement is a heavier material than vinyl, so it requires a more precise installation. And installations should only be performed by professionals who have been trained to work with the siding in accordance with its warranties. Repairs should not be attempted on your own. A poor installation and mistakes made during the repair process can void the warranties on your product and cause problems down the road. Because of its difficult installation process, Hardie Board siding can have a higher install cost than many other forms of siding. The process takes slightly longer and needs a keener eye and training for a perfect install. Never attempt to install this siding yourself. Not hiring a professional who is Hardie trained can cost you more down the road than the initial labor cost. Look for a contractor who is a Hardie Preferred Contractor. They have the seal of approval from James Hardie® itself, so you can better assess the level of installation quality you are receiving. Don’t waste your time and money on lackluster forms of siding that are difficult to maintain. Hardie siding’s benefits are simply a phone call away. Our expert team is trained to install Hardie Board, making the process seamless and smooth. Schedule a free consultation by calling us at (636) 978-5000 to find out if Hardie Board siding is the best option for your home.